As promised, here's a look at some of the new catalog goodies and a Sale-a-bration set I got yesterday. As you can see I'm still on the Valentine's Day card kick. The Candy Lane Designer papers are too perfect for V Day. 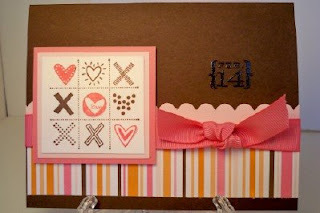 It's hard to see in the picture but I also used Stampin' Up's new Texturz plates for the Big Shot. The new Full Heart punch( $15.95) coordinates perfectly with the heart in the SAB Polka Dot punches set. Contact me and you can earn this set free with every $50 purchase from Feb 1 thru Mar 31st! I'll be at all day volleyball tournaments with my girls both Sat and Sun so no time to play and post. Have a good weekend! 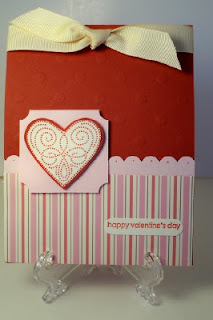 Did you know that the U.S. Greeting Card Association says one billion valentines are sent each year? Well I'm doing my part! 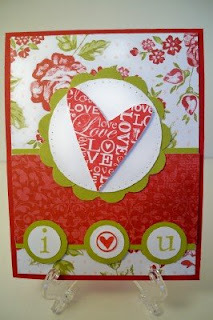 I've made another Valentine's Day card with the "A Happy Heart" set. I hope you can see the "Feb.14"-I embossed it. I also love the Sweet Always Designer Series papers-they're so fun and whimsical! New goodies tomorrow, hope to post on Friday!!!! Okay, I'm really branching out here! I did my first Mojo Monday challenge. I thought it was time to start on my Valentine's Day cards. My order from the new Spring Summer 2009 Idea book is scheduled to arrive on Thursday so I can't wait to play with my new goodies! HAPPY DAY! My first post! It's a Happy Day for me! It's my first post to my new blog. I thought I'd start with a card I made that showcases all of Stampin' Up's In Colors. 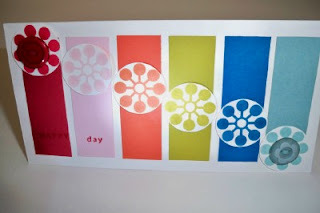 This card also uses the WOW Flowers stamp set and the Button Boquet Designer Buttons. The sentiments are from the retired Occasions Collection Level 2 set but there are tons of greetings sets in the Spring Summer Idea Book that you could use instead.